The United States, led by Carli Lloyd (10), drew a 77% bigger audience in this year's final than the previous Women's World Cup final in 2011. America loves winners, and none more than those who capture world championships on grand stages with millions of viewers watching around the globe. On Sunday evening, the U.S. women's soccer team earned that admiration, seizing the title that had eluded them since the Mia Hamm/Brandi Chastain-led '99ers. 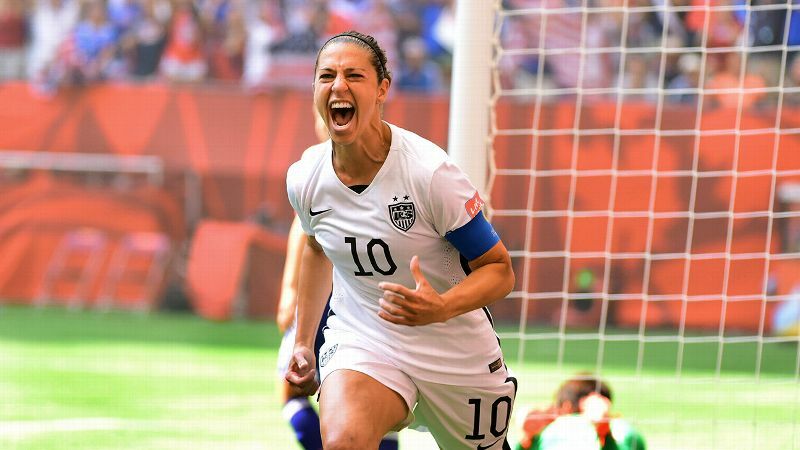 So now we can add some new heroes, some new household names to the world of women's sports: Abby Wambach, Hope Solo, and the MVP of the tournament, Carli Lloyd -- the kind of athlete America loves the most, one who produces the biggest moments in the biggest games. One who scores a goal for the ages. Interest in the 2015 Women's World Cup was unprecedented. 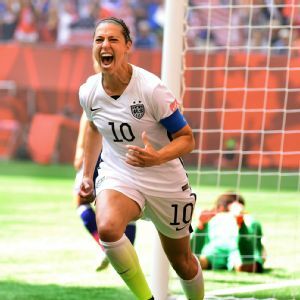 The six matches on Fox and Fox Sports 1 that featured the U.S. team averaged 5.3 million viewers, a rise of 121 percent over the 2011 Women's World Cup. 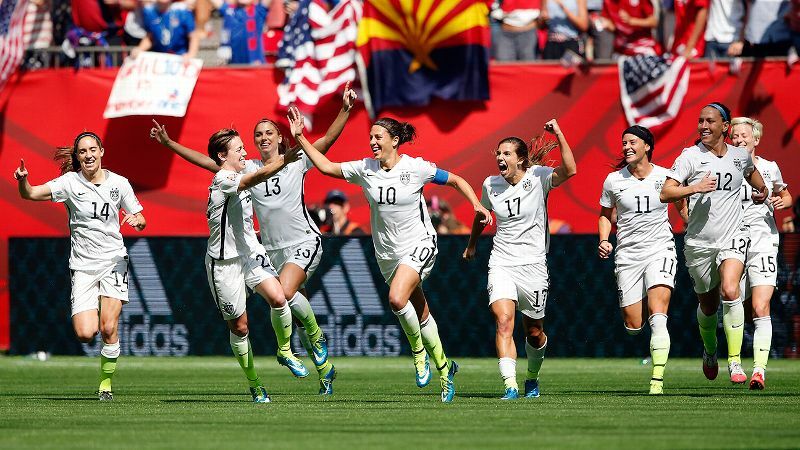 In the semifinal match, U.S. against Germany, 12 million viewers tuned in. The final game, U.S. against Japan, drew the highest metered market rating ever for a soccer game in the U.S. airing on a single network, with a total audience of 20.3 million viewers -- eclipsing the historic record set in the 1999 ABC broadcast of the WWC final between the U.S. and China. Said Michael Mulvihill, vice-president for Fox Sports, "I think it's fair to say [TV ratings] have exceeded our highest hopes." And the enthusiasm for the WWC was not confined to viewership alone. Fans filled stadiums to capacity throughout Canada, culminating in a 53,000-plus sold-out crowd in Vancouver's BC Place stadium for the final. Carli Lloyd, nicknamed "Captain America," recorded the earliest hat trick -- and third-fastest -- in a Women's World Cup game. Yet in the aftermath of such success -- and the creation of what should be a team, and a star, for the ages -- we may also hear a tired refrain, one that reporter Jessica Luther calls a "cycle of commentary that crops up whenever women's sports are the center of attention." The success and subsequent interest in women's sports only happens every four years during the World Cup or the Olympic Games. Once the hype and the glory of the moment fades, so too will interest in women's sports. As scholars who have spent our academic careers examining interest in women's sports, especially as that interest involves media coverage, we want to take this opportunity to dispel the myth that interest in and respect for women's sports is a once-in-every-four-years phenomenon. We also want to point out that this is only one of many myths surrounding women's sports. In highlighting -- and countering -- these myths below, we hope to provide knowledge about the growing interest in women's sports, and dispel the deep-seated stereotypes that still exist two generations removed from Title IX. Myth No. 1: Women's sports are underreported due to their lack of popularity, especially compared to men's sports. In a June 26, 2015 Washington Post piece, sports reporter Liz Clarke told readers that when it comes to women's sports, "people [are] long on opinion, even if they're short on knowledge." It is therefore no surprise that "women's sports are mired in misinformation." The first issue Clarke tackles to counter such misinformation involves the amount of media coverage given to women's sports. She argues that the media simply cover what is most popular, and that this is the primary reason that women's sports are underreported. Clarke (along with legions of sports editors and reporters before her) appears to be responding to critics' assertions -- and scholarly findings -- that even though, for example, females make up 43% of all scholarship athletes nationwide, and their overall participation has risen dramatically, they continue to receive only a miniscule portion across the ubiquitous sports media landscape. According to this year's update of a 25-year longitudinal study by sports scholars Cooky, Messner, & Musto that examined network affiliates in Los Angeles and ESPN's SportCenter, a mere 2-3 percent of media coverage was afforded to women's sports in 2014. Ironically, Clarke cites this very study, but counters with what seems to be a fair and reasonable point: She compares TV ratings for men's vs. women's sports, and says that "coverage of women's sports is in proportion to their popularity." But by framing the lack of coverage with what, at first glance, appears be a straightforward apples-to-apples comparison, Clarke misses a much greater -- and more relevant -- comparison. The popularity of men's sports does not operate in a cultural vacuum. For generations, definitions (and practices) of masculinity were equated with what it meant to be an athlete. And as every tomboy knows, any female who participated in sports, especially at elite levels in team sports, risked being stigmatized as not a "real" female. Moreover, though Title IX legislation mandated that equitable resources be allocated to female athletes, women's sports are still in their infancy relative to men's sports. Given such circumstances, as well as the enormous amount of literal and figurative capital that has been, and continues to be, invested in men's vs. women's sports, is it any wonder that men's sports are more popular? Yet by repeatedly making gender comparisons based on TV and attendance ratings, while simultaneously ignoring historical realities, we end up with what is really an apples-to-oranges comparison, simply because men have long held an enormous time advantage. Myth No. 2: The lack of media coverage is driven by market forces where the media cover what the fans are most interested in. According to Clarke, the so-called lack of interest in women's sports is simply the result of market-driven forces where, once again, if you look at ratings for women's vs. men's sports, the "clamor for more coverage doesn't appear to be a clamor at all." We suggest this oft-repeated myth is undercut when viewed from a different lens. Though it is certainly the case that, for example, ratings for the WNBA don't match those for the NBA, consider this: Women play professional basketball in the summer to a shortened 34-game season (compared to the NBA's 82 games). Not surprisingly, many fans prefer to be outdoors during the summer. Such a situation presents a unique challenge for the WNBA, and is in sharp contrast to the NBA set-up where the men get the gym first and play during the traditional season of fall and winter basketball. Yet once again, when highlighting TV and attendance ratings between the WNBA and the NBA, we end up making an apples-to-oranges comparison and in so doing, ignore a very different kind of comparison -- one that emphasizes the success of, and growing interest in, the WNBA. 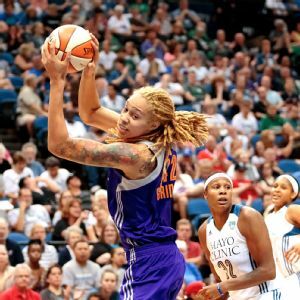 The popularity of Phoenix Mercury center Brittney Griner (42) is a big reason the 2014 WNBA Finals was the most-watched WNBA series since 2006. 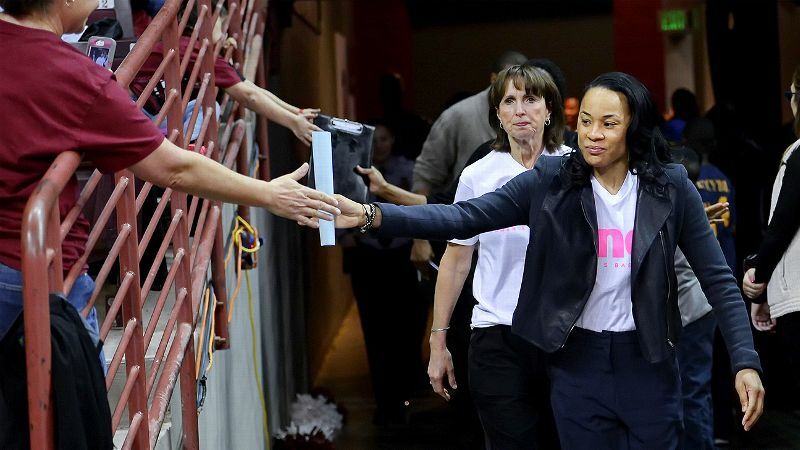 In spite of critics' yearly predictions about the demise of the League, 2014 marked another season of increased attendance, as well as the development of new stars such as Brittney Griner, Skylar Diggins and Elena Delle Donne. In terms of TV ratings, the 2014 WNBA Finals between the Phoenix Mercury and the Chicago Sky was the most-watched series since 2006. The games, which aired on ABC, ESPN and ESPN2, averaged 659,000 viewers, up 91 percent compared to the 2013 WNBA Finals series, and 38 percent compared to the 2012 series. Myth No. 3: Whether we like it or not, outside of such events as the WWC, there isn't an audience for a sustained interest in women's sports. The statistics cited above for the WNBA, along with the enormous response to the U.S. women's soccer team, help dispel the enduring myth that "nobody is interested in women's sports." The reality that Clarke and others fail to mention is that women's sports are much more popular than is generally reported, and it goes well beyond women's soccer. At the college level, women's softball is drawing bigger audiences than men's baseball. For example, the women's College World Series averaged almost 440,000 more viewers than the men's College World Series; both events aired on ESPN on the same days of the week, three weeks apart. What's more, the men's series has been in existence 35 years longer than the women's series. When viewers are given an opportunity to actually see women's sports, they respond with a rather amazing -- yet too often ignored -- interest, which could be capitalized upon even further through sponsorships, advertising revenue and improved media coverage. Myth No. 4: Women's professional sports leagues have failed due to lack of interest and corporate sponsorship. Clarke argues that "women's team sports have yet to prove commercially viable as a stand-alone enterprise," and points out that two previous attempts -- the WUSA and the short-lived Women's Professional Soccer -- both fizzled. Curiously, she criticizes the most recent attempt at developing a professional league, the National Women's Soccer League, because it has financial support from U.S. Soccer, and the Canadian and Mexican soccer federations. Rather than see such support as a positive marker of interest, she wonders will "a women's pro sports league ever stand on its own?" Let's compare such support to that given to MLS. In 2014, men's Major League Soccer averaged 240,000 viewers per game on ESPN, 142,000 on NBC and NBCSN, and 223,000 on Unimas. And even with 20 official sponsors, the almost 20-year-old league still loses $100 million annually. In spite of what would certainly be seen as a failure if such losses were associated with women's sports, the MLS recently negotiated deals worth $90 million over eight years with ESPN, FOX Sports and Univision Deportes for broadcast rights to its games. In contrast, the National Women's Soccer League has just three sponsors and no national TV contract. NWSL games for 2015 are only scheduled to be broadcast on YouTube. Clearly, the marketplace investments in these leagues are wildly different and lead to a self-defeating and self-perpetuating cycle: Despite widespread interest in women's sporting events such as the Women's World Cup, corporate sponsorships and investments in women's sports pale in comparison to men's sports, which in turn, limits the interest and demand for women's sports on what could be a much larger scale. As scholars who have conducted numerous empirical studies examining the intersections among sport, media and gender, we can state with certainty that both the quantity and quality of coverage of women's sports is dramatically worse than men's. This alone undermines a critical component for increasing interest in any sports endeavor: Building an audience through a sustained and committed effort -- one that reflects the reality of how many, and how much, women play sports, along with their unprecedented athletic achievements. When you consider the ever-increasing sports involvement of girls and women today, none of these myths makes logical sense. In 2013-14, the number of girls participating in high school sports increased for the 25th consecutive year to a record 3.3 million. At the college level, 42 percent of athletes are female. The number of adult women engaged in sports is similarly high, e.g., women comprised 42 percent of all marathon runners in 2012. Given these and many more statistics, how can it be the case that there isn't enough interest in women's sports to support professional leagues? Even a skeptic such as Clarke can see that the numbers simply don't support that claim. Finally, it's important to emphasize the large number of psychological (e.g., reduced depression), educational (e.g., increased educational achievement), and physical health benefits (e.g., improved bone health) associated with girls' and women's involvement in sport and physical activities. In addition, when adolescent girls and young adult women see media images of female athletes shown in action, they feel better about their own physical abilities. Turning the media spotlight on women's sports has the potential to reap a multitude of societal benefits. It also has the potential to dispel the many myths surrounding women's sports, even (and especially) those put forth by well-intentioned reporters like Liz Clarke.